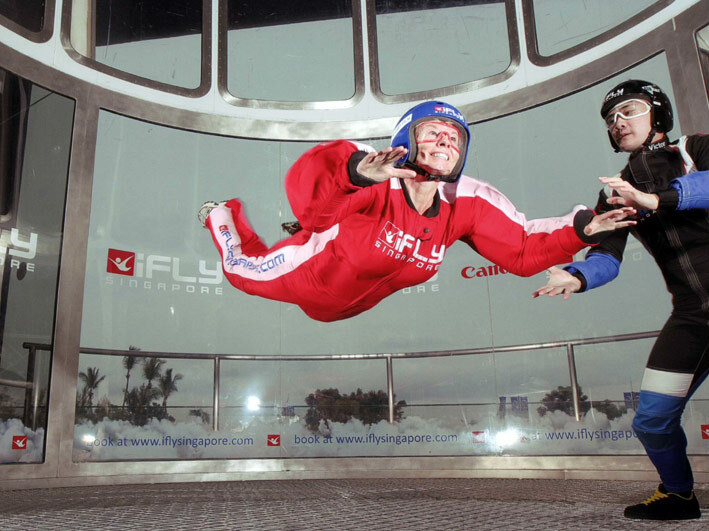 Mrs M still had no idea about her birthday surprise outing as we walked from the Siloso Beachfront car park into the entrance of the iFly Singapore building on Sentosa for our first Sky Diving simulation experience. After receiving a preparatory briefing, our group was equipped with jump suits, helmets, earplugs and goggles before being seated around the edge of the tunnel to wait for the turn to dive. Once inside the wind tunnel, it took a while to assume the correct position and then work out the effects caused by subtle changes in body position. I tried to smile for the camera but my flapping cheeks and dry teeth from the rushing wind gave me a grin like Wallace (of Wallace and Gromit). It was all over too soon. Mrs M looked very controlled for most of the time until she hurtled rather ungainly into the wall of the tunnel. She recovered with dignity. Most people coped extremely well, except for one boy who was totally rigid and another who was the complete opposite with no control over any of his limbs. It looked like the instructor was wrestling with a pile of spaghetti – at one point he scratched his head wondering what he could do with the flailing child. During our second dives, we were gaining some control of our movements and even had a few moments to experiment before being dragged back to the door after a couple of minutes. Mrs M pouted like a grumpy five-year-old when she realised some of the group were making third dives (at extra cost) and despite the financial implications we made one last all-too-short dive. It was great fun while it lasted. The entire activity took almost two-and-half hours for less than six minutes flying time. The cost of the extra dives and the mandatory photos on top of the entrance fee have made a nasty dent in the current account…….but it was much more memorable than a box of chocolates!